The MugWump 21 is livable on land while it’s being towed to the next adventure. Inspiration sometimes follows a strange and twisted path to reality, initially as simple sketches, later as a full design and later yet — if at all — as a living and breathing vessel on the water. While I often clearly remember a design’s evolution or inspiration, for the life of me, I cannot recall how the initial spark for the MugWump 21 landed in the punk of my mind, smoldering away till it sprang to flame, then was fanned to fire. In the big picture, the genesis is not important, as we have a full blaze going here in my boating fantasy. The gist of the idea merged the concept of the “tiny house” movement with the, shall I call it, “tiny cruiser” movement. Could we have a livable vessel that modest-sized vehicles could tow, usable both on land and on water as a habitat for a month or longer? The tiny house movement involves reducing the size of your abode to the smallest quotient possible. All functions need to be present, with living, sleeping, bathing, kitchen, entertainment and dining in the confines of a minuscule footprint. Converts espouse the benefits of reduced housing expenses, both at initial purchase and daily overhead. The money and maintenance time saved might be reallocated to a retirement fund or exploring the planet — perhaps both. I fully embrace the idea, and I can certainly imagine simplifying my living circumstances. Mind you, I have not pulled the trigger in my own life, but armchair contemplation of “what if” and “what might” is a source of intrigue in my designer’s head. Which leads us to the MugWump. 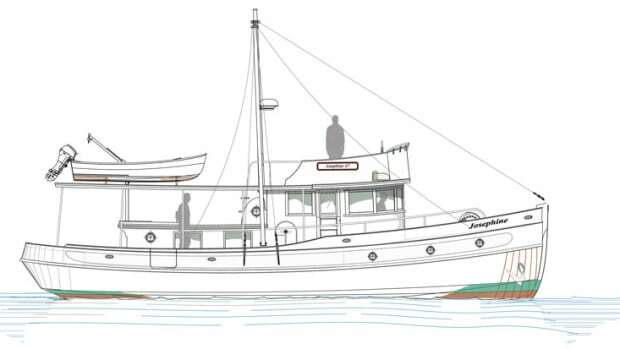 What fun it would be to plan trips around the base of this vessel — adventures with a measured investment, one that allows the time and energy to spend simply and efficiently, rather than straining resources. With just the bare essentials, every square inch of the layout is put to use. There has to be a budget for a project such as this. 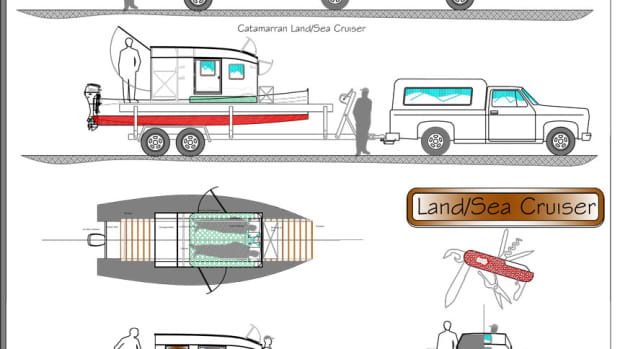 For expense-planning, there would be the boat, the trailer and a tow vehicle. The vessel needs to be large enough to be comfortable for my wife and me, and capable enough to achieve my moderately expansive cruising dreams. 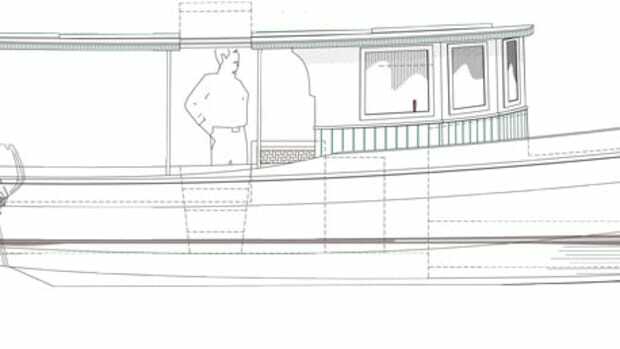 I might end up with more space if I built a less-seaworthy design, but that would be self-limiting, and I want more potential than what a shanty barge might offer. I’d also need to plan for the costs of running the boat and the tow vehicle. If I don’t keep a handle on all of the expenses, I wouldn’t be able to take time off from designing boats to slip the lines and cruise. I already have a three-quarter-ton truck. She is nearly 20 years old, but her diesel can tow up to about 8,000 pounds of boat and trailer. I really don’t want to tow anything that large and heavy, creating an entirely different level of stress. I don’t want the land transport to overwhelm my adventurous dreams. That, plus the spirit of the tiny house movement, means I am limiting the vessel to about 22 feet. Her beam is the legal trailering limit of 8 feet, 6 inches to allow all-hours towing on all roads without permits. I don’t imagine doing a lot of night towing, but at least I’d have the option. 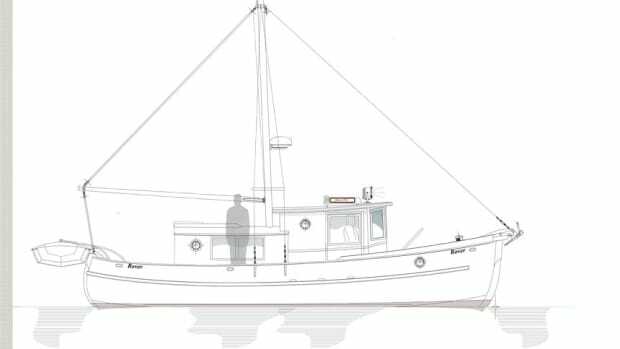 The height and space of the boat’s interior has to be generous enough to allow my 60-plus years of stiff back and body to function, so I envision full headroom in the main cabin and head areas, and sitting headroom in the bunk/sleeping area. I stand 6-foot-2, a height that calls for at least 6 feet, 4 inches of headroom in the main cabin, but I don’t want her so tall that I can’t store her in a barn or warehouse, or lose stability on the water. 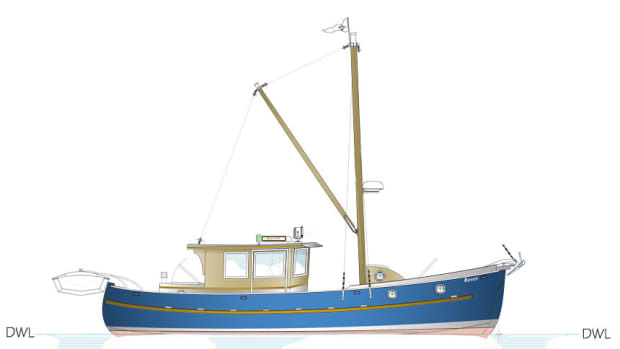 Thus, the MugWump 21 has an overall height of 10 feet, 11 inches at her highest point sitting on her trailer, and a 7-foot maximum height above the water when launched. A couple of kayaks on her roof will change that, but they can be removed. The barn I’d store her in has a door height of 12 feet, so she should fit inside easily on her trailer. Her shape is simple, yet she will be fine on all waters, as long as we keep a weather eye, and speed requirements are reasonable. I planned her around an outboard engine — a Command Thrust or one of the high-output models. These outboards are geared-down from the more common high-speed models and can swing a larger-diameter prop, which is just what I need with the hull that I have put under the MugWump. 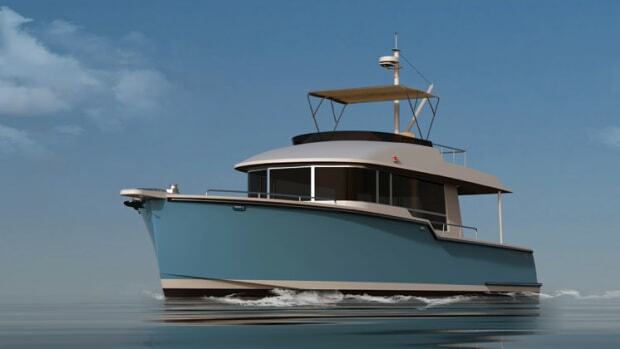 Top speed will be in the 12-knot range, with a smooth, quiet and economical cruise of 7 knots. I’d trade getting to my destination fast for a more relaxing run and better fuel efficiency, and enough ponies would be left to tackle a river, up or down current. The folding sundeck over the stern is a neat feature, covering the top of the outboard while allowing work to be done over the stern. 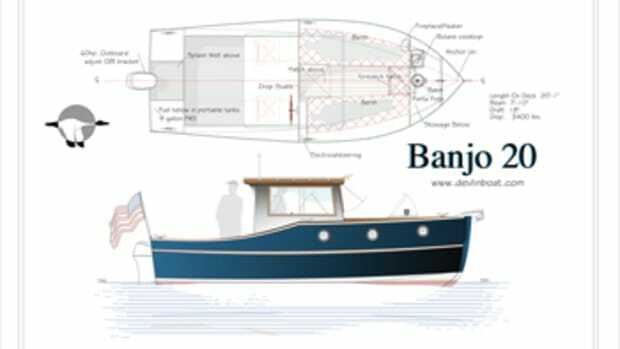 A dinghy could be carried on the stern, aligned athwartships to the centerline, secure and ready for use. I gave her a covered cockpit to have shaded seating and to allow weather cloths to be hung and give us another zone of use. (If I desire vitamin D, I can easily place a folding seat on the folding stern deck and soak up some rays.) The boarding door works on the water and on land, with pins that can be hinged vertically or horizontally, allowing the door to double as a boarding ramp or swim step, or allowing easier entry in a tight marina space. An off-the-shelf, collapsible swim ladder inside the door could be added for my morning swim. Bump-outs into the cockpit from the head compartment and the galley create headroom over the marine head to port and allow a cockpit locker to starboard. The tops of these could be used for a barbecue and a counter, and I might even talk myself into putting a small sink in one of them. 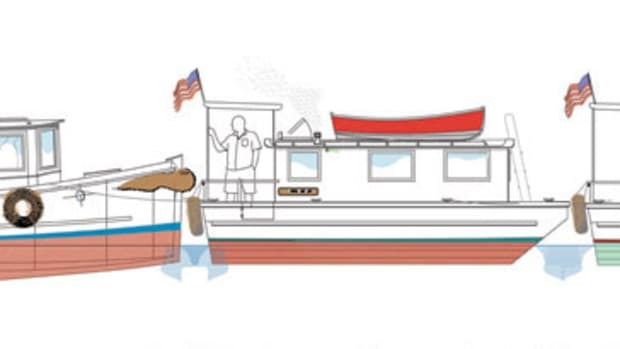 Moving into the cabin through twin hinged doors between the bump-outs, the head compartment is to port, with full headroom, and the marine sanitation device is placed slightly aft in the bump-out, with sitting headroom. This allows the area with standing headroom to be used as a wet shower. A simple hand pump evacuates the gray water overboard by Y-valve or into a built-in, 30-gallon black-water holding tank. Just forward of the head is a fore-and-aft dinette that seats four but accommodates two in greater comfort. The table can hinge down to create an extra berth, which also could be used as a reclining daybed with room to stretch underway. The off-watch crew would be at hand, but comfortable and relaxed. The galley is to starboard, with a sink, butane cooktop and drawer refrigerator. (An ice chest in the cockpit for extra stores could double as a seat.) If use is planned around more temperate climes, a cabin heater could be mounted. I recommend the Dickinson Marine Newport propane fireplace, which has air intake and exhaust in the same stack and works well for ambience and for heat, with 8,000 BTU. Unlike inboards, outboards don’t allow a heat exchanger to be scavenged off the engine-cooling water, so hot water needs to be driven off a 12-volt hot water heater or a roof-mounted day tank. Painted black, the latter could suffice. With the large roof area, there is also space for solar panels — as many as four at 72 watts each would keep up with the boat’s electrical demands. Forward, conventional port and starboard berths are almost 7 feet long and wide enough to allow normal sleeping positions. The notch between the berths could be filled, creating a more than queen-size berth, but I prefer the notch, which lets me sit up in bed, pull on my socks and get up in the middle of the night for anchor watch without disturbing my wife. The main house of the cabin is wide to allow interior volume in the saloon, but long handrails on the rooftop make the walk forward along the 6-inch-wide side decks safer. Alternately, a hinged hatch lets a crewmember stand on the bunk top and reach everything on the foredeck while remaining inside the boat. 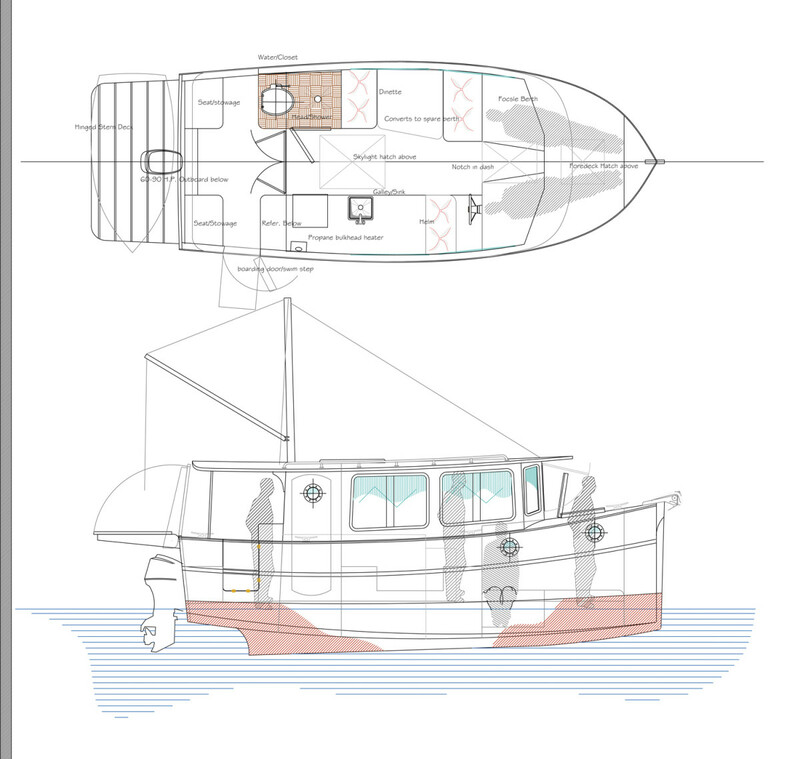 Light and ventilation are through four opening and screened windows, the foredeck hatch, an opening skylight in the main saloon and a windshield with a top-hinged center section. With all these openings, a lot of air can be let into and out of the boat, yet she will be snug and secure if the weather allows for only minimal fresh air.